Our modern world is complex. Constantly on the go, modern life pushes you further, harder, faster, with little given back; it can be easy to forget yourself. That’s why it’s so important to step back and take some time to recharge your batteries. Unplug from your digital devices and switch off from the world at large. For thousands of years, people have been turning to meditation to do just this. Meditation is an exercise which aims to improve attention and awareness. it’s to stop letting them control you." It has become especially popular since the 19th century, with many choosing to add meditation to their daily routines, aiming to negate the impact of the frantic lives we lead and better connect with themselves. Meditation has been linked to an increase in feelings of self-worth, inner peace and overall happiness, whilst reducing stress, anxiety, depression and pain. There are many ways that you can choose to meditate. Generally meditation is a solo activity, but it can also be practiced in groups. One of the most common ways to meditate is through concentration. Choose a single point to concentrate on; be it an object, an image, a sound or activity. Focus all of your conscious thoughts on this. If your mind wanders or you get distracted, do not get frustrated, simply reorient your concentration back to your focal point. Used correctly, both writing and drawing can be an effective method of concentration meditation. Copying text or a photograph can improve your mental concentration and focusing the brain on the sensations surrounding these can help focus the mind. If you are a writer, you can copy your favourite text or simply write and rewrite your personal mantra. If you prefer to draw, choose a photograph you like, then set to copying it. Do not worry if the lines falter and do not aim for perfection. The aim is to allow your mind to be free of conscious thought, except for the acknowledgement of the act itself. Think of the way you hold the pen, the feel of the pen touching paper, the sound as the tip glides across the page. Getting into nature and drawing a beautiful vista can also be used as a form of meditation. When you shut off the world outside apart from the view, the natural sounds and the art you are creating, you can free your mind and find meditative peace. Another popular form of concentration meditation is called ‘The Heart of the Rose’. Inspired by Robin Sharma’s book, "The Monk Who Sold His Ferrari", this technique is used to strengthen your control of your own thoughts. Mindfulness; instead of choosing an external point of concentration, you focus on yourself. Your breathing, how you feel, the sensations. When your mind wanders, you refocus, but note the thoughts, their basis and their content. Activity; using a physical activity to be mindful of your body and mind. Your focus should be on the feelings and physical senses activated through the activity. The ancient art of Tai Chi has always been a popular meditation technique, however recently many use running as a form of meditation. Keeping a meditation journal can be a great way to log your meditative journey. After meditation, spend a few minutes jotting down your experience. This makes you relive the session and reflect on the thoughts and feelings which may have come to the surface during. It also is a good way to keep track of when you have had a difficult day with lots of distractions or if you’ve had a very successful and peaceful meditation session. Looking back through your meditation journal can help you identify patterns of success and alter day or your sessions to improve your meditative practice and overall wellbeing. The practice of writing in itself can also help improve your meditation. By writing down the thoughts and emotions which may have otherwise distracted you during meditation, you bring these out of your subconscious and begin to think about why they are affecting you. Writing is known to be cleansing and cathartic and can help you work through any anxiety, trauma or concerns. In this way your mind can be cleared, ready for your next session. 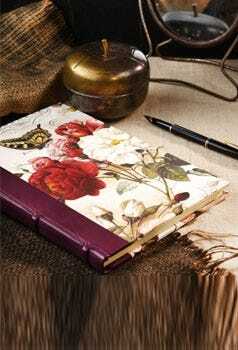 We suggest the beautiful Bomo Art ‘Roses’ design journal for anyone practising ‘the heart of the rose’ technique. Available in a range of sizes, you’ll find one that is perfect for your needs. See our full range of exquisite handcrafted leather journals. 2: The Monk Who Sold His Ferrari, Robin Sharma. Chapter 7. Page 70.